Shigeko Nagai, later—by her marriage to Rear Admiral Uriu—Baroness Uriu, was one of the first women piano teachers in Japan to teach Western classical music and a piano instructor to the first graduates of the Tokyo School of Music (1885). The daughter of a samurai who had been on the losing side of the civil war that brought about the Meiji Restoration, she was greatly affected by an era of cultural exchange between the United States and Japan. The Meiji Restoration dramatically changed the political, socio-economic, and cultural structure of Japan, ending 250 years of isolation and centralized feudalism under the Tokugawa shogunate and, under a new emperor, instituting a more democratic form of government. The last provision of the Charter Oath of 1868, a general statement of the aims of the Meiji leaders intended to boost morale and win financial support for their new government, called for "An international search for knowledge to strengthen the foundations of imperial rule." Shortly after, from December 23, 1871 to September 13, 1873, Japanese diplomats traveled around the world in what became known as the Iwakura Mission. As part of the educational aspect of the mission, the diplomats brought five very young Japanese girls to live and go to school in the United States. One of these five girls, Shige Nagai, was only 10 years old when she came to the United States. As a little girl Shige Nagai was sent to this country with future Vassar classmate and friend, Sutematsu Yamakawa—later Princess Oyama—and Tsuda Omeko, the famous Japanese educator who started a school for Japanese women and an American funded scholarship for Japanese woman. Shige was brought up under the tutelage of John S. C. Abbott, a historian, pastor, and writer, at New Haven, Connecticut. When the girls first arrived in 1871, they did not know a word of English, but five years later, an article in The Syracuse Courier proclaimed, "They speak English fluently". 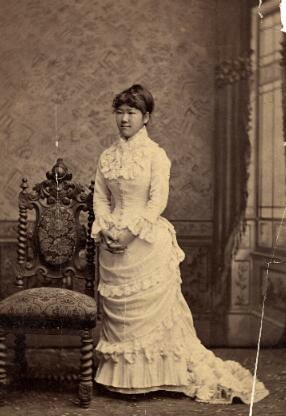 Shige Nagai entered the Vassar School of Art on September 19, 1878 , and she studied music for three years. Among the pieces she performed in music school recitals were Mendelssohn's "Lieder Ohne Worte, No. 21," Taubert's "Cradle Song," Schubert's "Impromptu" op. 90, no.4, and for her senior spring concert "Valse brillante, A flat major, op.34" by Chopin. In the School of Music, Shige took courses in singing, music theory, piano, organ, the history of music, music aesthetics, and acoustics. She would share her knowledge from the study of classic compositions of European masters with her piano students at the Tokyo school of music after she graduated Vassar in 1881. In addition to an intense curriculum of music, students were expected to take one or more courses of collegiate study. Shige Nagai took a semester of Mathematics her freshman year, and French and English Composition her following years. Students were accepted into the school of music if they were good students, passed entry exams in grammar, arithmetic, geography, and U.S. history, and showed evidence of sufficient natural talent. Although the School of Music was a separate division of the college, and not a department as it is today, Shige Nagai's 19th century musical education paralleled in many ways the typical course load of a 21st century Vassar music major. Every Vassar student must fulfill a quantitative requirement, as Shige did her first year, and fluency in at least one foreign language is still required. Shige Nagai became Baroness Uriu after her marriage to Baron Sotokichi Uriu, a rear admiral of the Japanese navy, in 1882. In anticipation of the couple's visit to America, the New York Evening Post wrote, "One of the mainstays of Japan's navy, Vice-Admiral Sotokichi Uriu, a graduate of the U.S. Naval Academy at Annapolis and a veteran of Japan's wars with China and Russia, is on his way to this country for a prolonged visit… His wife, who ranks as a baroness, is a graduate of Vassar College. So there is distinctly an American tinge to the Uriu household." Shige Nagai speaking with President Taylor at on Vassar Class Day, 1883. On this trip, Shige Nagai brought a ceremonial bowl from the Emperor to Vassar College. 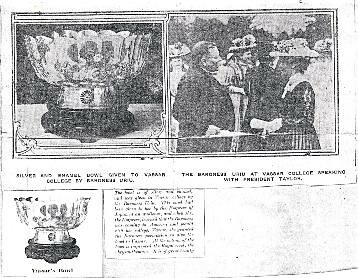 A clipping from a newspaper called The Enterprise noted, "Later, his majesty heard that the baroness was to return to her alma mater and he directed that the bowl be presented to Vassar College to show his appreciation of what it had done in an educational way for Japanese women. It would have been impossible for the baroness or anyone else to have presented or given away a royal present without such an order from the royal palace." However a newspaper clipping from the same article tells that it was the Empress who urged Baroness Uriu to give the bowl to Vassar. Baroness Uriu spoke to the Vassar Class of '83 on Vassar Class day. The (Poughkeepsie) Eagle described this event on June 9, 1909. "Brilliant features mark the Vassar Class day exercises…commenting in a general way on the progress made since her graduation, 2 years ago, Mme. Uriu turned to the advancement of women in her own country. "We too have changed," she said. "Japanese women have come forward and each year find new and great advances. There is no Vassar among us yet, but education for women and education methods are progressing. And women are steadily advancing along lines somewhat different from yours, yet progressing. Many of your own women have good schools in Japan for our girls to help them to become good and influential women and wives." Baroness Uriu's correspondence to Dr. James H. Ballagh, mentions two other visits to Vassar after her return to Japan in 1881, in 1909, and in 1915, when her husband was the Vice President of the Panama Exhibition. Dr. Ballagh was among the earliest missionaries to bring medicine to Japan in 1861. Shige's very courteous letter, written shortly after Princess Oyama's death, describes how her friend caught influenza which led to pneumonia and her death after several days of suffering. Baroness Uriu adds, "Ms. Tsuda is another friend left to me to whom I can talk of old American days." Jesse F. Wheeler, a friend of the Baroness from Vassar, visited her in Japan in 1928 in response to an invitation. Baroness Uriu had thanked Jesse for writing about Princess Oyama. "Your long interesting letter giving minute details of Princess Oyama's room after Alumnae Hall was read with joy and I thank you and the class for remembering my dear friend so lovingly." The two must have been in correspondence because Shige adds "You already know my husband is an invalid and we are living in Adawara near Hakune mountains. He is a little better so I should be delighted to meet you in Tokio and call on you at the Imperial Hotel." In a long letter to E. Home on May 9, 1928, Jessie Wheeler described her visit to the home of Baroness Uriu and to the children of Princess Oyama. When Mrs. Wheeler saw "a tiny figure, all in black, shining black hair, a little bent Japanese" she "at once" recognized "our merry little Vassar friend." Baroness Uriu introduced Wheeler to her family and the family of Princess Oyama, who were all in Japanese dress. They all spoke some English, and "Shige was there to help linguistically". At the home of K. Masuda, Baroness Uriu's nephew, the playwright joked, "My aunt really speaks English better than she speaks Japanese. She doesn't speak her native language grammatically." When Wheeler asked the Baroness if she kept many servants she said with emphasis, "No, just one housekeeper and sometimes also a student helper." The Baroness's friends and relatives were fascinated with Mrs. Wheeler's white hair, of which the Baroness had none. 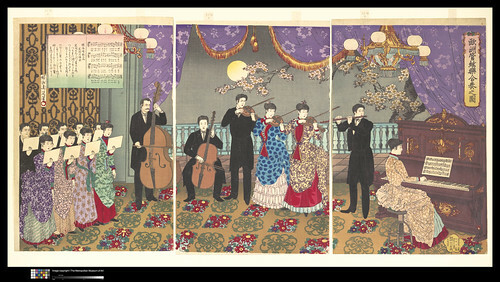 The glimpses of Shige in her correspondence and in the letters of those who knew her are enriched by recent speculation about two prints by the prolific Meiji era artist Hashimoto Chikanobu (1838-1912), "Picture of a Concert of European Music" (1889) and "Picture of Dignitaries Dancing" (1888). In the first print, Japanese lyrics have been added to a simple four-part harmony in the treble clef, which is played by a small orchestra and sung by a choir of Japanese. The eyes of the musicians are fixed on the pianist, as if following her tempo. In the second picture as well, the pianist on the left looks at the pianist on the right, as if following her lead. “A Glimpse of Dignitaries Dancing” Kiken butō no ryakuke: Signed: “Yōshū Chikanobu hitsu” with red toshidama seal Published by Morimoto Junzaburō, undated (datable to 08 February 1888) Courtesy Aoki Endowment Collection, Scripps College, SC2004.1.23. Although the art historian Julia Meech-Pekarik warns, "It is unlikely that the print documents a specific performance witnessed by the artist," she also notes that, "because there were still so few competent professionals, Japanese scholars have actually sought to identify some of the musicians. The pianist is said to be Uryu Shigeko, a teacher at the school and the wife of Rear Admiral Uryu". The leadership of the pianist implied by the gaze of the other musicians visually suggests that the pianist is a teacher. Baroness Uriu began teaching at the school of music in 1882, and she assisted Luther Whiting Mason, a Boston music teacher who had been hired by the Meiji government in 1880 to introduce Western instruments and form a course of study in singing, piano, organ, violin, and ethics, most of which subjects the baroness had studied at Vassar. During the same year the baroness began teaching at the Tokyo School of Music, where orchestral music had been added to the curriculum. She is shown in the picture of the first graduating class in July 1885, the only one in Western dress, standing behind first violinist, Koda Nobu.